Vienna (AFP) - Austrian ski king Marcel Hirscher has brushed aside any thoughts of taking it easy and is back in training for the upcoming World Cup season. The 29-year-old has dominated the World Cup landscape for the past seven seasons and in February he won his first individual Olympic titles in the men's alpine combined and giant slalom. His bid to become only the fourth skier in history to win a third gold at a single Winter Games came to a sticky end when he bombed out of the first leg of the slalom, missing a gate. 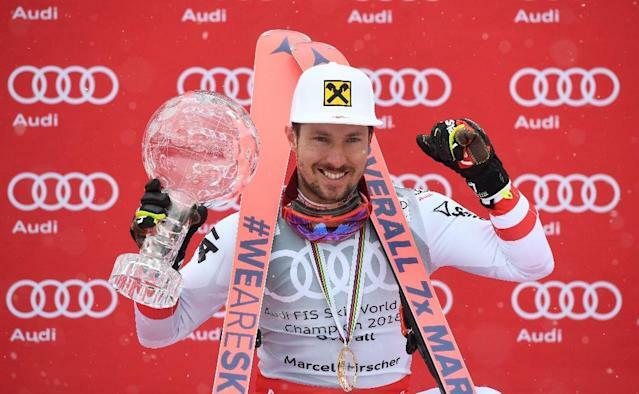 Newly married with a baby imminent Hirscher took to social media on Wednesday to assure his fans he was committed to adding to his tally of 58 World Cup wins. "I'm at Pitztal (glacier in the Austrian Tyrol) and training on snow has begun again. In 46 days we'll be racing and that's brilliant," he said, referring to the opening World Cup giant slalom at neighbouring Solden on October 28. Having flirted with the idea of a reduced schedule to spend more time at home in Austria Hirscher says he is approaching the new season "with the aim of once again being among the best and winning races". Then in a comment that will surely concern his rivals he added: "You can always improve your level of performance." The technical specialist confirmed that he would not be targeting a first downhill win, the only discipline missing from his trophy chest. "It would take me too much time. I'm no longer prepared to invest five years" to master the downhill, he said.